Persia ATS Blog: To find the right candidate in your database — easy! To find the right candidate in your database — easy! Good news for our users — search engine in "Persia" has become more convenient. We know how important it is for a recruiter to orient themselves quickly in their own candidate database, so we’ve added new search parameters and improved the existing ones. Jobs search. In search parameters we’ve added the ability to look for candidates who are already connected to specific vacancies, but they also have required categories for the new job. For example, a month ago, you have successfully shut down the marketing position, and now you’ve got the task to find a content manager for the customer. You suspect that your database has candidates who are suitable for the new job by category and skills. To find resumes you need to use the vacancies search. To begin you should define among which candidates’ position you want to find resumes. If necessary note the category and skills to filter out unsuitable candidates, and the result will give you a summary of suitable applicants. By the way, we have improved the search by category. Now, if you request to find two or more categories and select additional skills, the result will show you the resume which matches the best to your request. And what if you need to find a resume of the candidate, who lives in another country or city? The search by a country and a city — is few more new advanced search options. With this capability, you can easily find those candidates in your database in whos resumes is indicated the country and / or the city you are interested in. We have also improved the keyword search option. As before, you can choose the appropriate search mode "all words", "any" or "accurate", but now the system will give you the result in such an order — name, CV, comments on the CV and history. In addition, you now have the ability to add the job to the resume directly from the search results. You can link to the job all of found CVs, or select just few candidates. 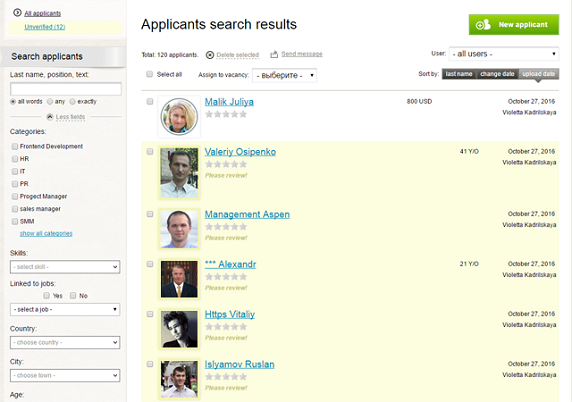 You can also import general information about the candidates from the search results to Excel-documents directly. Regarding to "Persia" advanced search, you can navigate your candidate database more quickly and get the most accurate results in a short time! Making Money Online By Becoming a Publisher at Ypick.me personally style proper as well as effective sociable methods tailored for your business as well as your brand. We will build in addition to keep an eye on your internet community, market your brand name, as well as drive actual wedding around the systems which best fit your company. Thank you for the tutorial! I use a Magento webshop platform, can I follow the same steps for segmenting it too? I also thought of linking the writingelites.net platform to my email marketing software to keep all of my data up-to-date at all times and to apply advanced segmentation and create targeted email campaigns.